“To photograph people is to violate them…. Just as a camera is a sublimation of a gun, to photograph someone is a sublimated murder.” Photo: P. 97 “On the road to Baghdad, an American convoy passes an Iraqi killed in a fight with marines in March 2003.” The New York Times, March 19, 2008 ORIGINAL: U.S. marine vehicles drove past a dead Iraqi soldier killed in a firefight with U.S. marines early this morning after Iraqi troops laid an ambush for the marines as they headed north to Baghdad from a trench position in central Iraq north of the city of Nasiriya. This and other essays backed her argument that photography was “essentially an act of non-intervention” that shared “complicity” in “another person’s pain or misfortune”. “Did more to increase the public revulsion against the war than a hundred hours of televised barbarities”. “—intimate participation in the promotion of the war (that) led directly to immeasurable Iraqi death and destruction”. “No longer read The New York Times”. Does Shields think substantive benefits would come from such a proclamation? Shields and I have combated ideas for years, leading to the collaboration on a book and film I Think You’re Totally Wrong: A Quarrel, as well as a curmudgeonly friendship. My understanding of his modus operandi leads me to suspect posturing and intentional irony in displaying the same photos that ‘glamorised’ war to enhance his art, the cover (reminiscent of Rothko) an example. Shields does not deny how photography has contributed to progress, from Mathew Brady’s Civil War black and whites, Walker Stevens’ pictures of the Depression era South, to the contributions of Robert Capa (who died after he stepped on a mine in Vietnam). His focus is only the Times. The photos hold significance and power, separated into ten chapters, ‘Nature’, ‘Playground’, ‘Father’, ‘God’, ‘Pietà’, ‘Painting’, ‘Movie’, ‘Beauty’, ‘Love’, and ‘Death’, framed with quotes from Cormac McCarthy to Gore Vidal, the majority taken in Afghanistan and Iraq post 9/11, but also some from Aleppo, Bosnia, Gaza, Islamabad, and Arlington National Cemetery. 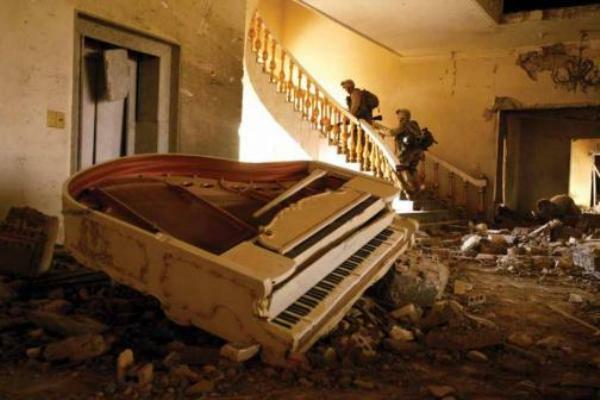 A soldier’s camouflaged helmet peeks out of a field of pink and white poppies in Afghanistan, an Israeli tank enters Gaza underneath clouds and dust, a niqabi walks in the rust ochre air on a Baghdad street; a crushed piano sits amidst rubble in Saddam Hussein’s son’s palace. 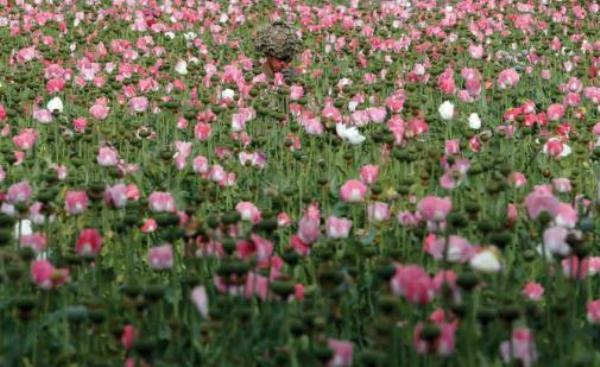 ORIGINAL: A U.S. Army Officer from 5-20 infantry Regiment attached to 82nd Airborne walks through a poppy field while on patrol in Zharay district in Kandahar province, southern Afghanistan April 26, 2012. ORIGINAL: ZIKIM, ISRAEL: A column of armored personnel carriers (APC) crosses theIsraeli border into the Gaza Strip at sunrise, 06 July 2006, from the nearby Kibbutz of Zikim. 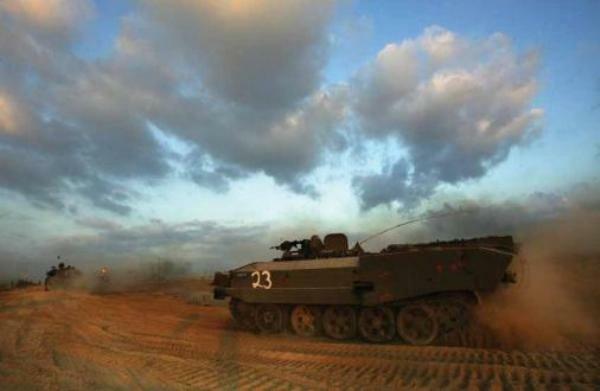 Israeli tanks moved deeper into the northern Gaza Strip today, effectively establishing a new buffer zone after attacks from improved Palestinian rockets are now able to reach further into Israel. ORIGINAL: A sandstorm is filling the air over Baghdad with very fine powdery dust. 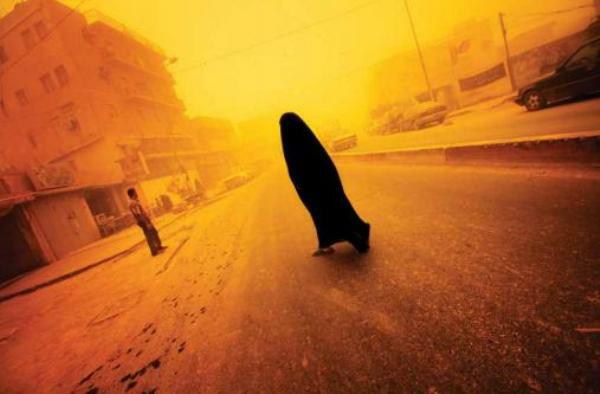 A woman is crossing the street in Baghdad’s Karada neighborhood. ORIGINAL: BAGHDAD, Iraq—April 10, 2003—IRAQ-BAGHDAD-8—American soldiers patrol inside a palace which belonged to Uday Hussein in Baghdad, Thursday, April 10, 2003. The palace was heavily bombed by coalition airpower. 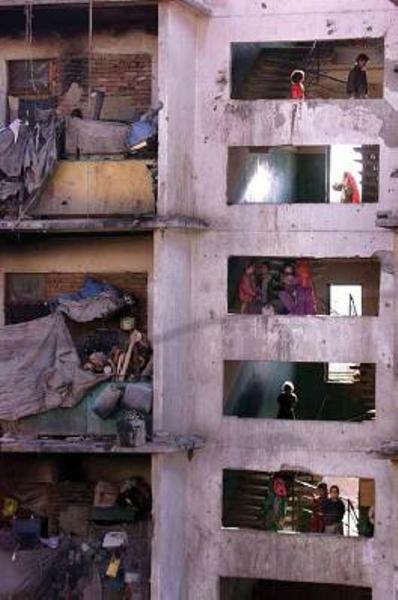 Soviet Embassy in Kabul last week, where they have been living for several years. 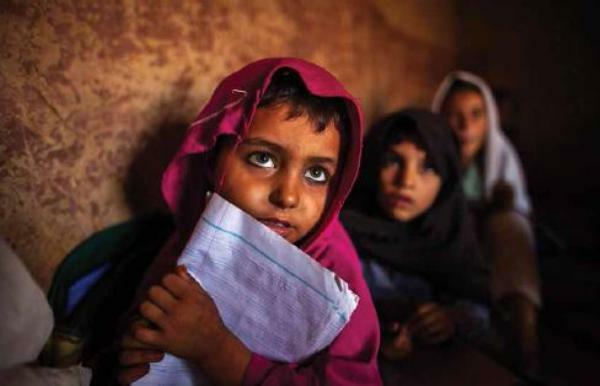 ORIGINAL: Girls attend lessons at a school in a slum on the outskirts of Islamabad October 11, 2013. 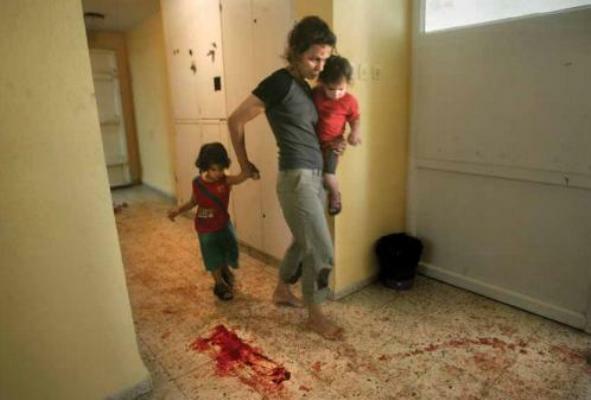 ORIGINAL: A woman walks with two children past blood on the floor at the scene of a rocket attack in the northern Israeli city of Acre August 3, 2006. Hizbollah guerrillas killed eight people in Israel in a rocket barrage on Thursday despite an intensive Israeli ground and air campaign to wipe them out, as world powers struggled to end the 23-day-old war. 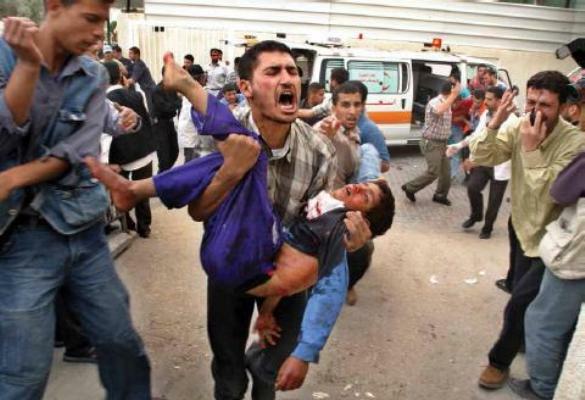 ORIGINAL: Palestinian man carries a dead boy killed when Israeli forces opened fire on a protest march at the Rafah refugee camp in southern Gaza Strip May 19, 2004. Israeli forces killed eight Palestinians in an attack on a crowd of people in Rafah, Palestinian witnesses and medics said. 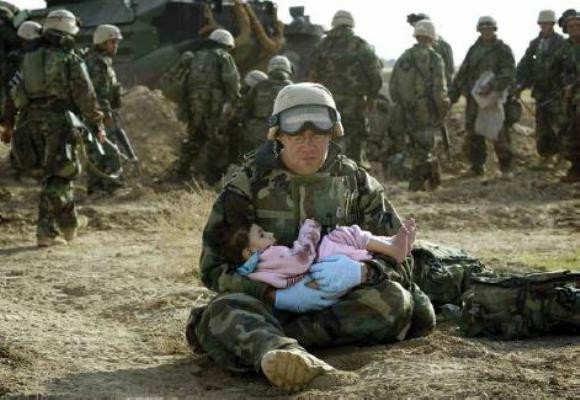 ORIGINAL: U.S. Navy Hospital Corpsman HM1 Richard Barnett, assigned to the 1st Marine Division, holds an Iraqi child in central Iraq in this March 29, 2003 file photo. Confused front line crossfire ripped apart an Iraqi family after local soldiers appeared to force civilians towards positions held by U.S. Marines. March 20 marks the one-year anniversary of the beginning of the U.S. led war against Iraq. 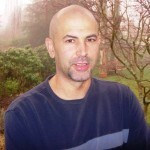 The war started on March 20 Baghdad local time, March 19 Washington D.C. local time. ORIGINAL: In this photo by Joan Silva, Ali Hadi, a professional body washer, prepares the body of a bombing victim for Muslim burial as the man’s relatives watch in Najaf, Iraq, on March 3, 2004. Silva was severely wounded on Oct. 23, 2010, when he stepped on a mine while on patrol with American soldiers in southern Afghanistan. Do these images propagandise war or elicit revulsion? Does the photo of a one-armed woman bouncing a ball with her physical therapist at Walter Reed Medical Center lead “to immeasurable Iraqi death and destruction?” or to the question, “Was her sacrifice worthy?” In many cases, the verdicts embedded in Shields’ essay fail to complement the photos. Shields, whose most profound line here is “war is a force that gives us meaning,” taken from Chris Hedges anti-war book, has judged before acknowledging paradox. What Bertolt Brecht wrote in 1931, “Photography, in the hands of the bourgeoisie, has become a terrible weapon against the truth,” contradicts how Don McCullin’s images of the Biafran War caught the attention of the French Red Cross and helped lead to the formation of Doctors Without Borders in 1971. John Berger and Roland Barthes questioned the ethics of photography, Diane Arbus may have exploited her subjects, but withheld judgment. The relevance of beauty in Shields’ framework, also, betrays his argument. The clumsiness of four Sonderkommando photos does not take away from their spectral and accidental beauty, or the pathos. Should Gilles Peress or Allan Sekula or Sebastião Salgado have been better off using grainy blurred images? Visceral beauty promotes bellicosity as easily as it promotes pacifism. What did Nick Ut do after taking his Pulitzer Prize winning photo? He rushed Kim Phuc to the hospital. I’d wager that most New York Times photojournalists, with encouragement from their higher ups, would have done the same. All photos are screenshots from the PDF of War is Beautiful.